Because of Chinese characters' unique square form and various orthography mapping rules, many researchers have been focusing on whether the cognitive course of reading Chinese characters is similar to that of reading alphabetic words . The aim of this study is to investigate the cognitive process of these two languages using high frequency and pseudo words (characters). Eleven native Chinese-English bilinguals (five males, age: 23.5 ± 2.3) participated the study. MRI scans were performed at the General Hospital of PLA by using a 1.5-tesla MRI scanner (GE_SIGNA, Milwaukee, WI). The results indicated that similar brain areas (termed as "direct route") were involved in the processing for high frequency words (characters) in both languages. 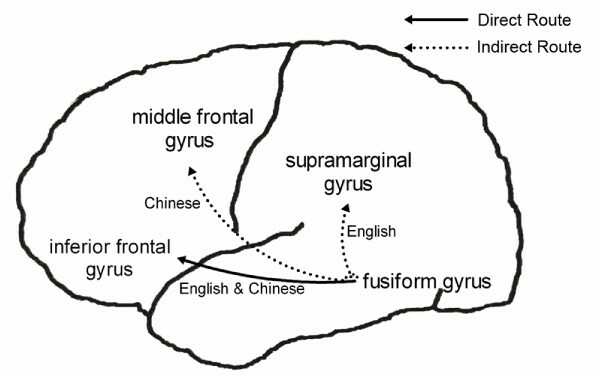 In contrast, the English pseudo words activated greater volume in the left supramarginal gyrus, while the Chinese pseudo character activated more in the left middle frontal gyrus (termed as "indirect route", see Figure 1). The direct route and indirect route for Chinese characters and English words processing. These findings suggest that Chinese-English bilinguals may adopt the dual route mechanism to read Chinese characters and English words [2, 3]. Just as with the native English speaker, the left supramarginal gyrus is important for bilinguals to convert English orthography into phonology . When reading Chinese characters, the left middle frontal gyrus may play a similar role as the left supramarginal gyrus in reading English words for the orthography converting . This work was supported in part by National Natural Science Foundation of China Grant 30670699, Ministry of Education Grant NCET-06-0277 and 021010.